This month we will continue working on our blocks from the Booklet "Art to Heart: Imagine" by Nancy Halvorsen. 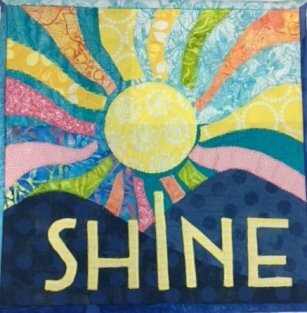 We will begin to do some free motion quilting on any blocks completed from previous months, and learn to join them with a quilt as you go method. You may also bring your supplies to work on the next block: Three background pieces, scraps for the applique, soft fuse, and threads for decorative stitching. Please refer to the book for the sizes.